Long before there was a Las Vegas, even before there was nationwide Prohibition of alcohol that led to the rise of the gangsters and businessmen who would eventually put Las Vegas on the map, Newport, Kentucky was the original Sin City. Even as early as the Civil War, this river town was known for gambling, dog racing, and prostitution. Prohibition only strengthened this reputation as businessmen took advantage of America’s thirst by building empires which included everything from brothels to high end nightclubs. Throughout the '50s and '60s, residents and governments fought to push these businesses out. There is a notorious story about a candidate for Sheriff running on a reform platform who was drugged and photographed with a local prostitute in an attempt to make him appear corrupt. Ultimately the FBI found the drugs in his system and he was exonerated and elected anyway, beginning the decline of Sin City. Adult movie theaters and strip clubs were shut down, and in 1973 Frank “Screw” Andrews, a once prominent gangster, was allegedly thrown from his sixth-story hospital room, signaling the beginning of the end of Newport’s Sin City reputation. Restoration to historic homes began in the late 1980s and then businesses like the Newport Aquarium started to move in during the 1990s. Today you can’t even tell the area was once the Las Vegas of the Ohio Valley, which has allowed a Renaissance that has led to the creation of The B Line. I sat at the bar in Bouquet, a farm-to-table stop on the B-Line, to have dinner. Bartender Austin Garrison made me his signature Smoked Old Fashioned with Elijah Craig Small Batch and Bourbon Barrel Foods Bourbon Smoked Salt. Originally a wine bar, now there are 120 bourbons and Glencairns in which to serve them, a sign of a strong bourbon bar. There are plans in the works to do a bar barrel pick of OKI at nearby New Riff (more on that to come). 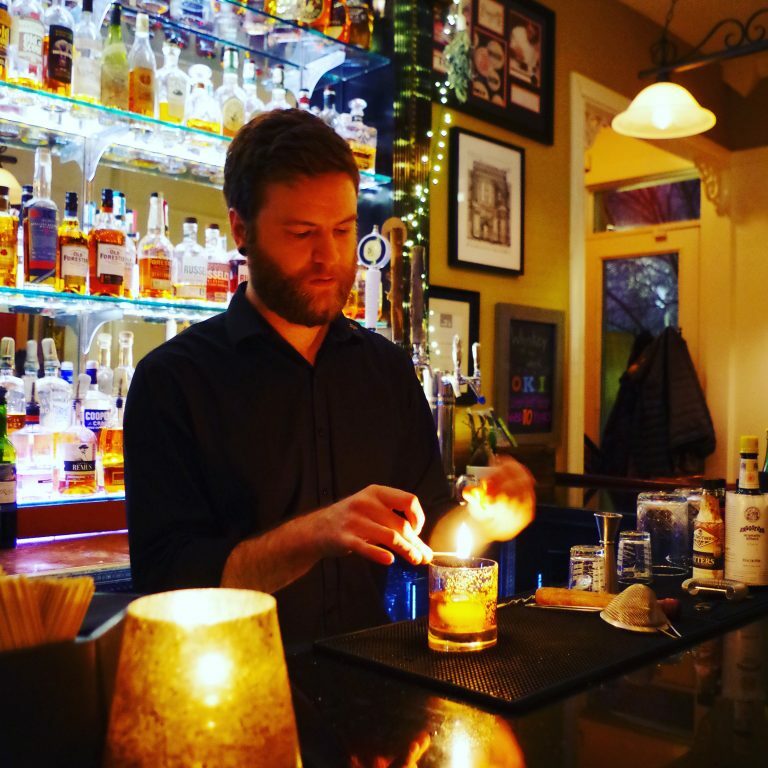 Garrison was highly knowledgeable about bourbon and was passionate about sharing his experience with the steady flow of customers on a Saturday night. I enjoyed an appetizer of house-made pickles and a dinner of beet salad before heading to my next stop. Sunday morning begins with a visit to Newberry Brothers Coffee Shop and Prohibition Bourbon Bar in Newport. “We front as the coffee shop with the bourbon bar in the back,” says owner Kim Newberry. It’s an oddball among coffee shops - it’s only open in the morning on the 3rd Sunday of every month. The rest of the time it is open Thursday, Friday, and Saturday nights from 5 p.m. until 11 p.m. or 1 a.m. Coffee is roasted on-site and pastries are made from scratch by the Newberrys, who live upstairs. The bar is somewhat hidden - you have to go to the back of the shop, through a small hallway, past the restrooms, and then suddenly you’re in the Prohibition Bar. There’s even a speakeasy room behind the bar for small groups of no more than 6 people to do events and private tastings. This is the most striking of all the hidden gems on the B-Line so far with more than 1500 whiskeys and multiple events and tastings, including fundraisers, throughout the year. It’s also right across the street from a restaurant where parts of Rain Man were filmed back in the late 1980s. Former MGPI Master Distiller Larry Ebersold, who has clearly kept very busy, was also instrumental in the plans for this distillery. The OKI Bourbon currently being sold is, much like Boone County Distillery’s Boone County 1833 Bourbon, bourbon distilled during Ebersold’s tenure in Lawrenceburg. This connectedness is indicative of the kind of camaraderie often found in the bourbon industry where the mantra is “a rising tide lifts all boats.” Rather than being in competition with each other, these businesses have instead banded together to bring in travel and tourist dollars to all their businesses as well as to regrow the once booming Northern Kentucky bourbon industry. I’ve been checking out this area and waiting for something like the B-Line for years. It just makes sense - right across the river is the control state of Ohio, so people are already crossing into Kentucky looking for a good time. On my last trip I checked out Old Kentucky Bourbon Bar, Molly Wellmann’s Bourbon Bar in Covington with over 600 whiskeys established in 2012. Without a doubt this is one of the best bourbon bars in the region, if not the world. The Tousey House Tavern, also a member of the new B-Line, was one of the surprising places I stumbled upon way out in Burlington, Kentucky. They have a cabinet full of about a dozen dusties that they sell by the pour thanks to the new Vintage Spirits law in Kentucky. Also on the B-Line are a few places farther outside of the Newport/Covington area. Old Pogue Distillery in Maysville was a very large distillery before Prohibition, and it was put out of business during Prohibition because of some of those same gangsters in Newport. 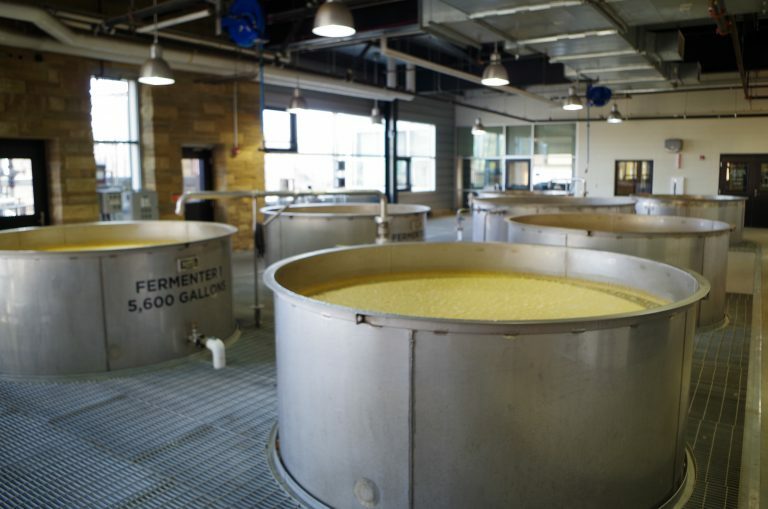 The Pogue family reopened the distillery on a smaller scale in 2012 and tours are available by appointment only because they are often given by the distiller himself. On the quaint Main Street in this old river town is Chandler’s, a hidden gem with a massive bourbon selection. Thanks to the new B-Line bourbon tourists will be paying greater attention to this once bustling bourbon region of Kentucky. Learn more about the B-Line and participating establishments here.